Online ordering of Operation Christmas Child materials is no longer available for the season. Remember: you can continue participating this season by packing shoeboxes online with our PackaBox.ca website! You can choose the items to go in the box, and add a photo and personal message, or we can choose the items for you. You can also discover the destination of your online shoebox gift! Select the “Follow my shoebox” checkbox, and we will email you when we know which country your shoebox(es) will be sent to. The email will share about the impact that shoebox gifts are having on children, their country, and the spreading of the Gospel message. On behalf of everyone here at Samaritan’s Purse Canada and Operation Christmas Child, thank you for making a difference in the life of a child this Christmas. You are a blessing. Prepare to pack your Operation Christmas Child shoeboxes by ordering free resources. Whether you’ve been packing shoeboxes for years, or are participating for the first time, we’ll provide everything you need to get started for the fall shoebox season. Each item will help you pack and send your shoebox gifts, as well as spread the word about Operation Christmas Child to your church, group, or community. We will begin shipping all materials in September. If you require your items sooner, please call 1-800-303-1269. Before you continue and place your order - Did you know that you can now order plastic operation christmas child shoeboxes? Our new plastic shoeboxes are made of durable, high-quality materials and are not only keepsakes for the children who receive them, but are a practical household items useful for years to come. 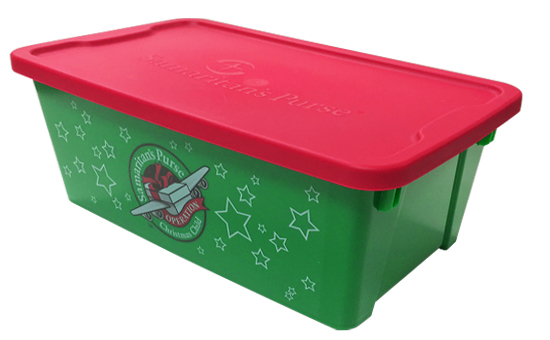 For Canadians wishing to purchase and pack Operation Christmas Child plastic shoeboxes, they can be ordered via Christian Book Distributors (a US-based retail organization) at “Christian book” dot “com” on their Operation Christmas Child page. 2. In the search bar type in "Operation Christmas Child"
3. The Operation Christmas Child plastic shoeboxes will be the first item in the list of results. 4. Click on "Operation Christmas Child Shoebox (Qty 12)"
Note: If you wish to order cardboard shoeboxes, continue below. Is your group participating for the first time? Included in this kit is everything you need to get started - How to Pack a Shoebox Brochures, cardboard shoeboxes, posters, prayer guide bookmarks, and a promotional DVD. All you need to do is decide how many shoeboxes your group is planning on packing and order the kit that is the right size for you. For example, if your goal is to pack 50 shoeboxes, choose 1 ’Kit for 50 shoeboxes’. Once you’ve chosen your kit, you are ready to place your order – just click on ‘Next Step’ to the right. Empty Operation Christmas Child cardboard shoeboxes – easy to build and easy to fill with gifts for children overseas. Important: Cardboard shoeboxes available in increments of 25. Do you have any shoeboxes left over from last year? Please use all the boxes you currently have and only order what is needed for this shoebox packing year. Also remember that any box that is close in size to a standard shoebox can be used. We encourage you to check with local retailers for shoeboxes, it's a great way to re-use material. As you place your order, please prayerfully consider a donation towards the mailing and production costs of these cardboard shoeboxes (See step 4). Brochure includes step by step instructions on how to pack a shoebox, suggested gift items, boy/girl shoebox labels, and a donation envelope. Each brochure contains 1 boy label and 1 girl label. The DVD is a powerful way to show the incredible impact of Operation Christmas Child and inspire donors, churches, and community groups to get involved! You also can view the contents of the DVD in English and download these videos online. Use this colorful poster to spread the word about Operation Christmas Child. Includes white space so you can write in local information. A bookmark sized card to lead people in daily prayer for Operation Christmas Child.